Some of the major dignitaries involved in Sunday’s Buffalo Soldier event, stand at salute, while the annual wreath dedication segment takes place. The group were some of a large crowd that turned out on the US Military Academy grounds to honor the courageous African American soldiers, stationed at West Point while fighting to defend this country. These words were the mantra that symbolized the vision of the Buffalo Soldiers, a brave and patriotic group of African-American soldiers, who relentlessly fought to defend our country against some of the most insurmountable odds. 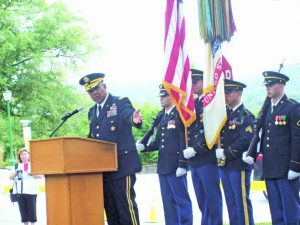 Sunday, those members who were a part of the 9th and 10th United States Cavalry Regiments, who once served at West Point, were honored at a special annual ceremony, saluting their everyday heroic efforts that forever transformed this country. First created by the Army Reorganization Act of 1866, the Buffalo Soldiers’ early service was on the Western Frontier, engaging in 11 war campaigns. Whether it was in 11 of the campaigns during the Indian (from 1867-1891), Spanish, World War I or II or Korean War, these Buffalo Soldiers-dubbed that nickname by their Indian foes – fought with honor, dignity and loyalty to their country. In 1907, the 9th Calvarly was assigned to West Point. It was here that cadet riding instruction along with mounted drills took place on the very grounds now occupied by the athletic field. It was granted the namesake “The Cavarly Plain” and was in clear view across from Sunday’s Ceremony, where the dedicated plaque to the Buffalo Soldiers resides and a large crowd came out to once again pay tribute to these devoted unsung heroes. United States Military Academy Superintendent, Darryl Sullivan, addresses the crowd at Sunday’s Buffalo Soldier Commemoration event, honoring the brave African-American soldiers of the 9th and 10th Cavalry Regiments, stationed at West Point, and defending this country through many major wars. African-American soldiers carry a long history defending this country. In fact,185,000 served in the infantry during the Civil War. Regardless of what walk of life they came from – whether it be a sharecropper, writer, painter, or cook – they had a prominent, singular Buffalo Soldier purpose. “They assembled and served for one reason: to defend the country they loved,” pointed out Corey Angel, Garrison Public Affairs Officer, who also pointed out that the Buffalo Soldiers were some of the first park rangers as well as that many did see actual combat duties, involving over 100 battles. Also speaking at the Ceremony was Darryl Williams, Superintendent of the USMA. A 1983 graduate of West Point, Williams was quick to cite the profound impact one of the Buffalo Soldiers, Sergeant Sanders H. Matthews, who passed away two years ago, had on his own life. 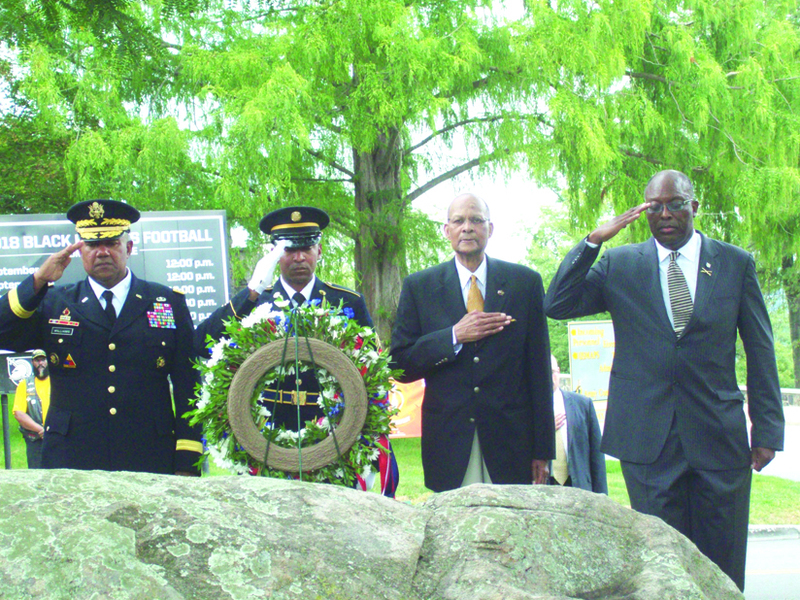 Signs of the Buffalo Soldiers’ indelible footprint can be seem all over today. Whether it’s in songs, emblems or even a movie such as “Glory,” the memories of their valiant acts and unwavering patriotic values set the bar on so many levels. It’s that barometer that Dr. Andrea Mathews, granddaughter of Sergeant Sanders H. Matthews as well as the President of the West Point Buffalo Soldiers Inc. spoke about following the Ceremony.